In his quiet pipe the while. "In 1914 a young girl began her first job as a shorthand-typist at the Boy Scout Headquarters in Victoria Street, London. She was later to become Confidential Secretary to the Founder of the Boy Scout Movement, and to marry Major Wade, then Organising Secretary. "With the coming of the war that year and the call-up, the author took on new responsibilities, and was soon working closely with the Baden-Powells in their country home. Soon after they bought Pax Hill the Chief found a cottage for the Wades nearby. Mrs. Wade would walk over to Pax Hill, often arriving on the scene at breakfast time, when the mail was opened and the letters passed over to her for reply. She watched his ideas for Scouts develop, as she worked with B.P. on his many books. Many of the best ideas came to him when fishing, or bathing—or shaving, and they would reach her on scraps of paper…." Eileen Wade served Baden-Powell as Confidential Secretary and assistant until his death in 1941. The Piper of Pax, written in 1924, is an excellent short biography of B-P. It includes an excellent account of his early career in the army and the founding of the Scout Movement. Of special note are many selections from his diaries and his letters to his mother. THE boys who joined the Scout Brotherhood in 1908 knew their Chief as the Defender of Mafeking. You who are joining to-day only know him as the Chief Scout. You do not remember a time when there was no Chief to sound the call of Scouting, and no boys to follow it. First, because you were born late enough to be Boy Scouts. Secondly, because you were born soon enough to be Boy Scouts under Baden-Powell. 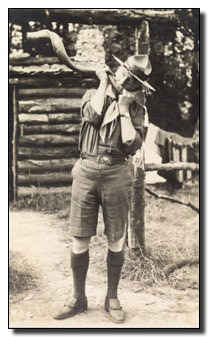 Scouting has come to stay, and we hope there will always be a Chief to lead the boys of the world; but between Baden-Powell and any other Chief Scout there will always be a gulf fixed. There can never be another discoverer of Scouting, any more than there can ever be a second Founder of Christianity. Others may carry on and spread the gospel and keep the flag flying, but they will find the game ready made for them. That is why it has seemed to me that you might like to know something about the life of your Chief. I want here, on your behalf and mine, to thank all those kind people—Sir Alexander and Lady Godley, Lady Smyth, Colonel W. B. Winwood, Colonel Tom Marchant, Sir H. Seymour King, Mr. T. E. Page, Colonel C. Callwell, Mr. P. W. Everett, the Editors of the Carthusian, the Church Monthly, The Greyfriar, and the Scout, Mr. S. M. Ellis, Mr. E. H. Parry, Messrs. Herbert Jenkins, and many others—who have helped me to make this story as complete as is possible in so small a volume. Above all, I would thank the Chief Scout and Lady Baden-Powell for allowing me to burrow so freely among the family archives. Eileen K. Wade, 27 Years with Baden-Powell, 1957.